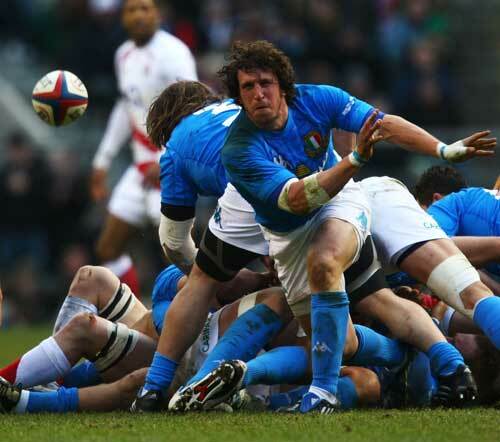 Stade Francais flanker Mauro Bergamasco has been included in the Italy A squad for the Churchill Cup. The Italian international, who has won 84 caps for the Azzuri, missed the entire Six Nations due to a shoulder injury and failed to recover in time for Stade's end of season run-in, which culminated in Amlin Challenge Cup defeat to Harlequins. Bergamasco is joined in the 28-man squad by former Gloucester lock Marco Bortolami. Italy A will face Canada at Franklin's Gardens on June 4 before meeting Russia on June 12. Forwards: Matias Aguero (Aironi), Dario Chistolini (Padova), Alberto De marchi (Aironi), Fabio Staibano (Aironi), Tommaso D'Apice (Roma), Andrea Manici (Parma), Valerio Bernabo' (Treviso), Marco Bortolami ( Aironi), Joshua Furno (Aironi), Cornelius Van Zyl (Treviso), Nicola Belardo (Cavalieri), Mauro Bergamasco (Stade Français), Francesco Minto (Treviso), Manoa Vosawai (Treviso). Backs: Edoardo Padovani (Marchiol Mogliano), Tito Tebaldi (Aironi), Riccardo Bocchino ( Aironi), DuRandt Gerber (Parma), Andrea Bacchetti (Rovigo), Angelo Esposito (Tarvisium), Denis Majstorovic (Cavalieri ), Gilberto Pavan ( Aironi,), Andrea Pratichetti (Treviso) Matteo Pratichetti (Aironi), Michele Sepe (Treviso), Giulio Toniolatti ( Aironi), Ruggero Trevisan (Crociati), Giovanbattista Venditti (Aironi).